We believe in supporting and building employee careers. Many of our associates have progressed throughout the organization. 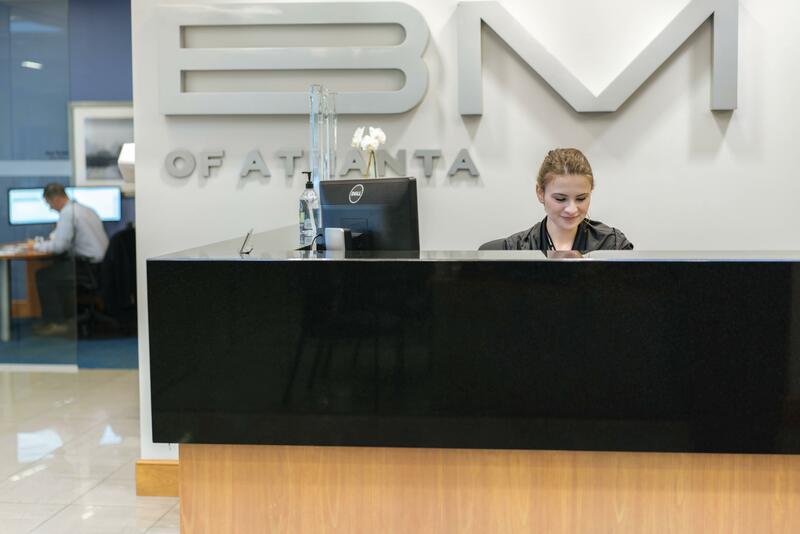 RBM of Atlanta is a privately owned and operated Mercedes-Benz dealership with an innovative and storied history. RBM of Atlanta’s innovations include the first loaner vehicle fleet in the Georgia and the first mobile service. We are an award-winning Mercedes-Benz dealership, one of the most established in the Southeast, and has been Atlanta’s Mercedes-Benz Connection since 1964. Mercedes-Benz experience or other highline model is preferred but not required. We are a high volume and quick paced service department. 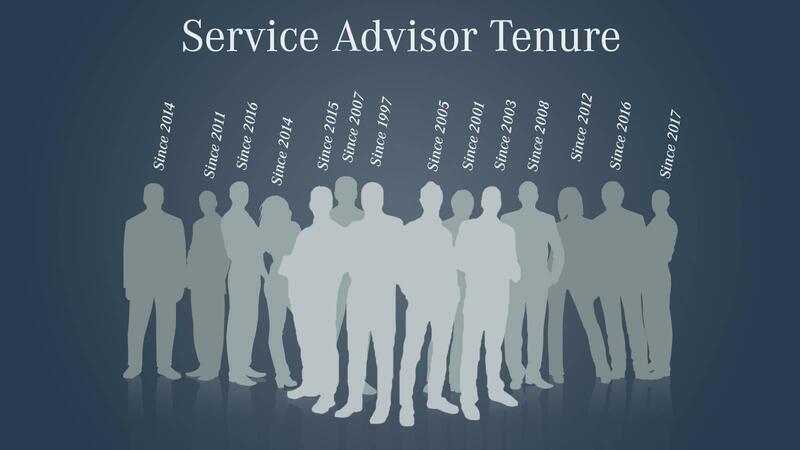 Find out why the average tenure of our service advisors is over 10 years and why we have one of the finest service departments in the country. RBM of Atlanta has over 72 service bays with state-of-the-art equipment housed in two climate-controlled service facilities. 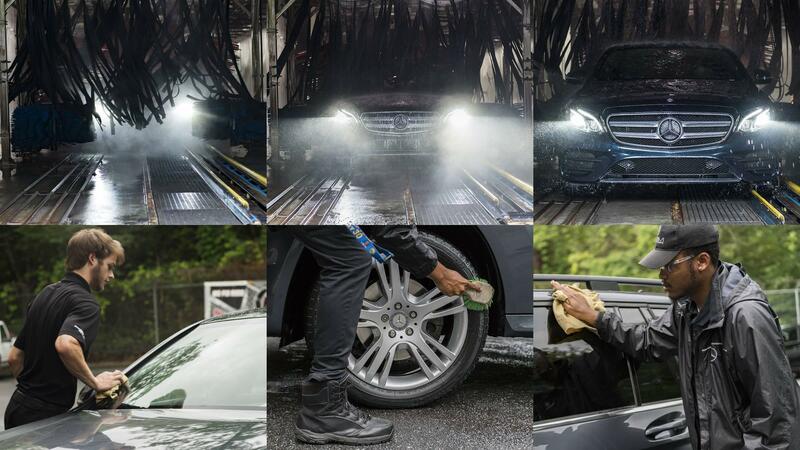 We also have an onsite car wash and a dedicated climate controlled detail facility. RBM of Atlanta offers a clean and comfortable work environment! We are a high volume, quick paced service and parts departments that operates 6 days a week. If you are qualified and have the desire to work for an award-winning dealership, please contact us. Warmly welcome and greet all service clients in a timely manner in the main service drive. You are our ambassador; your charm is clearly evident in everything you do and/or say. Maintain a professional personal appearance and work space. Actively listen to our clients and their needs and interpret body language and tone in order exceed client’s expectations, solve problems, and de-escalate issues. Communicate with service customers to determine the nature of their mechanical problems and service needs. Ask questions and test drive client cars in order to provide technicians with an essential information. Advise customers on the care of their cars and the value of maintaining their vehicles in accordance with Mercedes-Benz’ specifications. Properly present and show value in Mercedes-Benz recommended maintenance plan using maintenance menus. Communicate (present and sell) the need for additional work when needed; explain the details to the customer, including the additional cost and time consideration and document properly on repair order. Accurately record maintenance and/or repairs needed and conveys to technician. Process extended warranty claims for clients. Handle telephone enquiries regarding work in process and appointments and return phone, email, and text messages promptly. Deliver vehicles to customers and answer any questions, review work performed and explain charges and coverage. Keep clients updated with timely progress reports on vehicle status throughout visit. Work is conducted inside, outside, and in a shop environment in proximity to moving vehicles, mechanical equipment, with exposure to chemicals, and moderate to loud noise levels. RBM of Atlanta’s innovations include the first loaner vehicle fleet in the Georgia and the first mobile service. We are an award winning Mercedes-Benz dealership, Georgia’s only 4 time winner of the Prestigious Mercedes-Benz Best of the Best awards. We are one of the most established in the Southeast, and has been Atlanta’s Mercedes-Benz Connection since 1964. RBM of Atlanta has 72 service bays with state-of-the-art equipment housed in two climate-controlled service facilities. We also have an onsite car wash and a dedicated climate controlled detail facility. RBM of Atlanta offers a clean and comfortable work environment! We are a high volume, quick paced service and parts departments that operates 6 days a week. RBM of Atlanta is looking for car washers for our high volume service operation. You will be responsible for maintaining the exterior and interior appearance of our courtesy vehicle fleet and customer cars for our service organization. Are you currently a valet or a cash wash attendant? This would be a great position for you. You must be a self starter, meticulous, responsible, and have very good attention to detail. This is a high earning potential career with opportunities to grow within the company. Ensure that car windows, sunroofs, and doors are properly secured before prepping and washing. Vacuum interior of vehicles, including front, rear and trunk mats. Place mats back in proper locations if removal was required with vacuuming / cleaning. Dust (polish) the interior of the car and make sure that any trash is disposed-off properly. Wet and wash bumpers prior to going through automatic car wash.
Spray, scrub, and clean wheels prior to going through car wash (based on type of wheel and level of dirtiness). Make sure that the roof of the car is cleaned or wiped according to instructions. Ensure that the car is properly dried from the inside and the outside. Drive cars through the car wash area and the automated car wash with care/ ensure safety of others. Ensure that any accessories taken out of the car during the car wash procedure are put back before handing the car to the owner. Ability to apply common sense understanding to carry out written or oral instructions. Ability to deal with problems involving a few concrete variables in standardized situations. RBM of Atlanta’s innovations include the first loaner vehicle fleet in the Georgia, Express Service, and the mobile service. We are Georgia’s only 4 time winner of the prestigious Mercedes-Benz Best of the Best award. We are one of the most established in the Southeast, and have been Atlanta’s Mercedes-Benz Connection since 1964. The primary goal of a Service Concierge is to ensure our clients have a truly exceptional experience when coming in for Service. The concierge primary responsibility is to maintain the high quality standards of the business, by providing outstanding customer service, treating each customer with care and the utmost standard of professionalism. You are part of the “air traffic control team” to ensure clients get to the right person at the right time. You will provide our clients with answers to their questions and navigate them through the service appointment process seamlessly while ensuring business policies and procedures are followed at all times. Warmly greet and welcome clients and other quests to the dealership. Use my dealer lot technology to greet customers by name. Do not leave the work station desk unattended. Manage the waiting area and amenities. Ensure that the snack area is always clean and fully stocked. Actively listen to our clients and their needs and interpret body language in order exceed client’s expectations, solve problems, and de-escalate issues. Record details of inquires, comments, and complaints. Generate courtesy car loaner agreements, explain terms to clients, collect required documentation, and complete vehicle inspections. Check-in courtesy cars being returned by clients when picking up their vehicle from service. Check-in clients for service appointments and ensure that no client waits too long to speak with an advisor. Maintain tow-in log and lost-and-found. 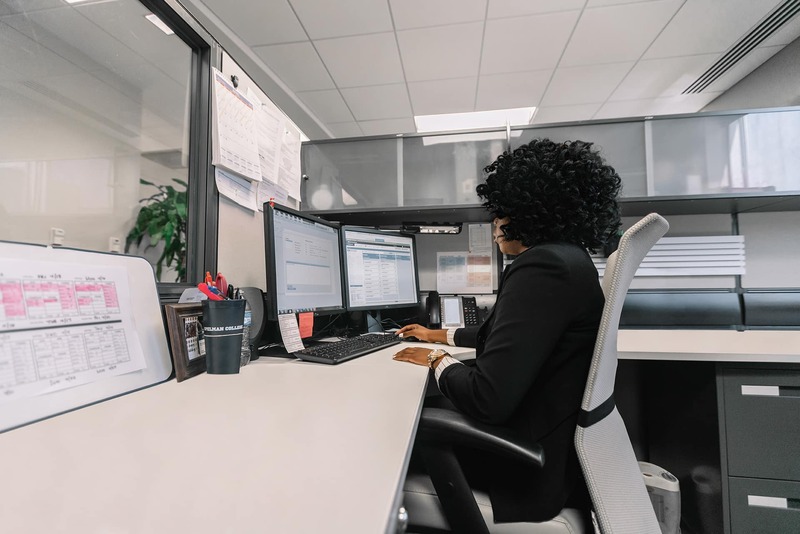 Check-out clients picking up their vehicles from service, collect payment, and connect them with their advisor or manager if they have questions. Support the active delivery process. High manufacturer CSI customer satisfaction survey scores is a must, you’re part of this process and review. Ability to write simple correspondence and reports. Work is conducted inside, outside, and in a shop environment in proximity to moving vehicles. Looking for a great automotive career in Automotive Retail? Then you are looking at the right place. RBM of Atlanta is a privately owned and operated Mercedes-Benz dealership with an innovative and storied history. RBM of Atlanta’s innovations include the first loaner vehicle fleet in the Georgia and the first mobile service. We are an award winning Mercedes-Benz dealership, one of the most established in the Southeast, and has been Atlanta’s Mercedes-Benz Connection since 1964. 4 time winner of the Mercedes-Benz Best of the Best Award. Enhances the customers’ positive service experience by providing an outstanding, memorable, and personalized attention to our clients on the phone by assisting with: service appointment setting, troubleshooting basic automotive questions, connecting calls to other parties in the dealership, checking on service status, resolving and following up on any client issues brought to your attention. Makes outbound calls per day to client’s whose service has been completed, inquiring about their experience with the dealership and ensuring they are completely satisfied with every aspect of their visit. This role is an integral part of the customer experience journey for our clients, setting the tone and our client’s expectations for their entire visit with our service department. 100% of client interaction is on the phone, so you must be able to effectively communicate in an articulate, empathetic, and professional tone. Patience is not just a virtue but a requirement. Answers incoming phone calls to the dealership in less than 15 seconds of initial ring. Assists clients in setting or rescheduling quality service appointments. Assists clients by answering questions or connecting them to the correct party in the dealership. Makes outbound calls to clients who missed their scheduled appointment. Makes outbound calls to clients who have recently been in for service to check on satisfaction. Effectively communicates client issues with dealership employees via text, email, and/or phone. Accurately records information in various computer applications during the appointment setting process or issue resolution. Uses good business and customer service judgment to solve client issues. Operates computer and phone system equipment. Maintains a professional appearance and work space. Physical activities include: remain stationary for long periods of time, operate office equipment, and repetitive motion.